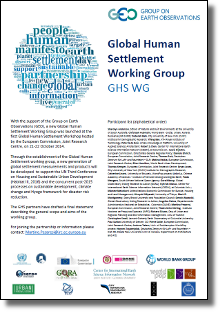 With the support of the Group on Earth Observations (GEO), a new Global Human Settlement Working Group (GHS WG) was launched at the first Global Human Settlement Workshop hosted by the European Commission, Joint Research Centre, on 21-22 October 2014. The scope of the GHS WG is to support the GEO task SB-04-C1: “Global Urban Observation and Information” by establishing and fostering a new community of practices focused on specific goals that will lead to a new generation of global settlement measurements and products in support to post-2015 international processes on sustainable and urban development, climate change and disaster risk reduction. In particular, the GHS WG shall test the production and the use of new global human settlement information products derived by the integration of multi-disciplinary data, namely global remote sensing, environmental, population and socio-economic. The scope is global and multi-disciplinary, with a particular emphasis on the generation of new global fine-scale information products made available through advances in remote sensing technology and open public data access policies. the Sendai framework for disaster risk reduction 2015-2030 [http://www.wcdrr.org/preparatory/post2015]. People have endeavored to change the earth since their earliest days. Now a profound global transformation is underway as our population moves from a primarily rural and agricultural society to one that is becoming more urban with every day. We increasingly live in towns, cities, even megacities. Urbanization is happening at a rapid pace. In the last 50 years, an additional 4 billion people have settled on this planet – the population increases by more than 150 extra people every minute: but exactly where these new people live remains largely unknown. We may believe we know the single branch of the tree on which we sit, but we ignore the tree and the forest within which it grows. 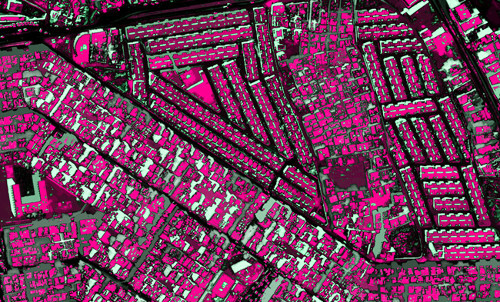 The density, the heterogeneity, the dynamics of human settlements and their interactions with the environment are fundamental pieces of information we need to have at hand to help us keep in balance the use and regenerative capacity of our planet’s resources. The current picture of the human footprint is incomplete. The majority of small and medium-sized settlements, critical for accounting and understanding the impact of people on the globe, remain largely invisible. The big dots may be visible, but not the all-important connections between them. And the truly vulnerable, such as those dwelling in refugee camps, shantytowns and slums are effectively missing from our global understanding. Scientific evidence supported by new technologies should be harnessed to its full extent to generate a comprehensive and holistic understanding of the complexity of human presence and its interactions with the earth’s social, economic, and ecological environments. Such vital information should enable global action to prevent and reduce disaster risk, eradicate extreme poverty and promote sustainable development. This statement for a Global Human Settlement partnership calls for a collaborative and integrated approach with which to advance our knowledge of where people live and how settlements are changing. The statement calls on the GEO (Group on Earth Observations) to facilitate this partnership and to support its work. The increasing capabilities of Earth Observation satellites combined with rapid advances in geospatial sciences, analytical methods and computing power have made detailed, measurable and globally consistent descriptions of the human-made habitat possible. This statement promotes full and open access to the data offered through these advances, and to the global human settlement information generated from them. The statement recognizes that bringing together information producers, users and those responsible for associated policies will facilitate the validation of existing and new global human settlement metrics, and will determine their fitness for purpose. Through the establishment of a Global Human Settlement partnership, a new generation of global settlement measurements and products will be developed to support the concurrent post-2015 processes on sustainable development, climate change and Hyogo framework for disaster risk reduction, and the UN Third Conference on Housing and Sustainable Urban Development (Habitat III, 2016).